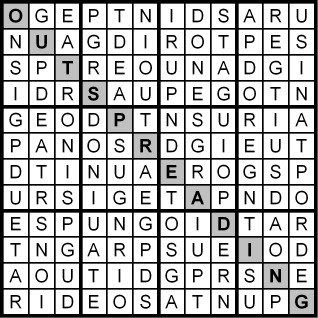 In honor of Halloween, I'm presenting you two 9x9 Hidden Word Sudoku puzzles; the first uses the letters in the anagram HE TAN GRIM. 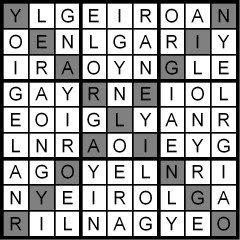 The second special Hidden Word Puzzle is based on the letters in the anagram IQ GAVE RUN. 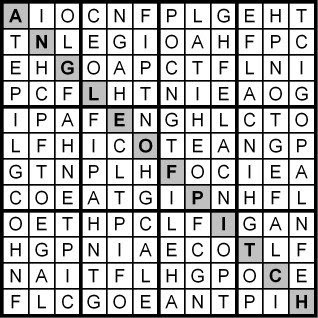 Yesterday's Word Sudoku puzzle was based on the word LIGAMENTS. A couple of Halloween Hidden Word Sudoku puzzles coming your way in a few hours. 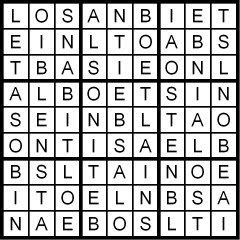 Today's Word Sudoku puzzle is based on the word LIGAMENTS. Solution in the morning. 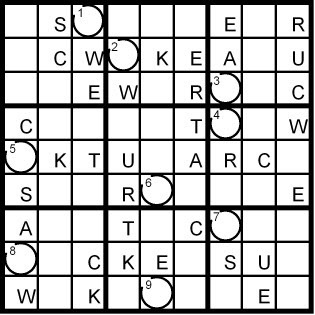 And tomorrow, in honor of Halloween, a couple of specially-made-for-the-day 9x9 Hidden Word Sudoku puzzles. Yesterday's Classic 9x9 Word Sudoku puzzle was based on the word POSTURING. 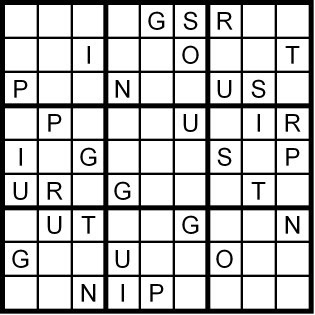 Today's Classic 9x9 Word Sudoku puzzle is based on the word POSTURING. Yesterday's Word Sudoku puzzle was based on the word DOSIMETRY. A new puzzle for you in a bit. 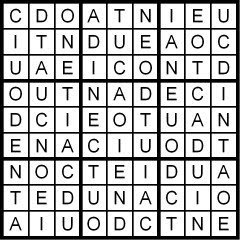 And Friday, two 9x9 Hidden Word Sudoku puzzles for you, in honor of Halloween. 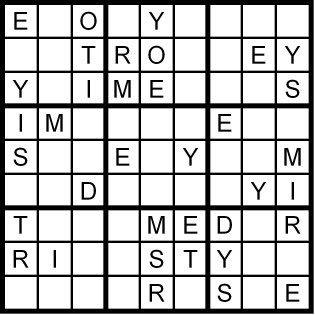 Today's Classic 9x9 Word Sudoku puzzle is based on the word DOSIMETRY. 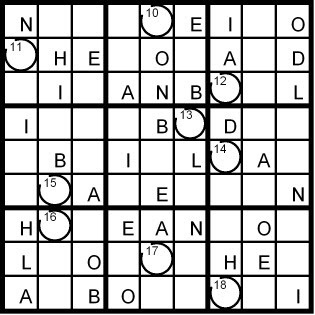 Yesterday's Classic 9x9 Word Sudoku puzzle was based on the word TAILBONES. 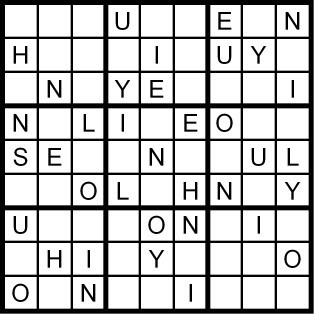 A new Word Sudoku puzzle in a bit. 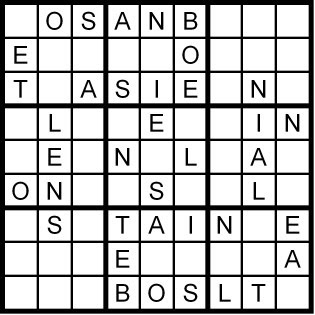 Today's Classic 9x9 Word Sudoku puzzle is based on the word TAILBONES. Solution first thing in the morning. And later this week, I'll present you a couple of 9x9 Hidden Word Sudoku puzzles in honor of Halloween. 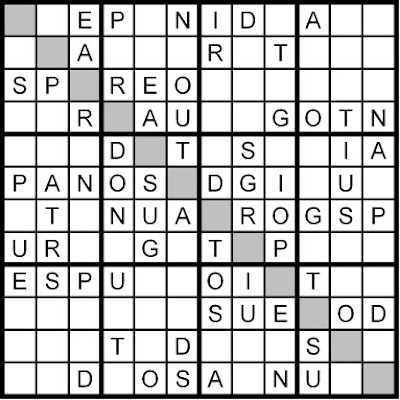 Yesterday's Sunday Challenge, a 12x12 Hidden Word Sudoku puzzle, was based on the letters in the anagram GIANTS POURED. 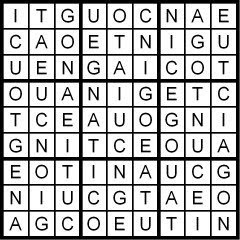 Today's Sunday Challenge 12x12 Hidden Word Sudoku puzzle is based on the letters in the anagram GIANTS POURED. 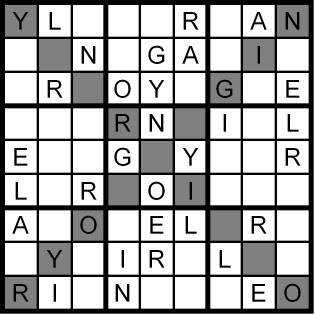 Yesterday's Diagonal Word Sudoku puzzle was based on the word LEGIONARY. Today is Saturday! 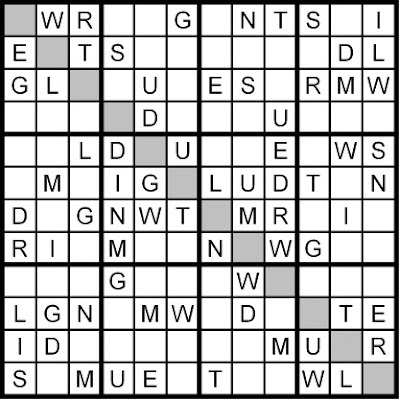 Every other Saturday, I present you a slightly different Word Sudoku puzzle--a diagonal rather than classic puzzle, this one based on the word LEGIONARY. 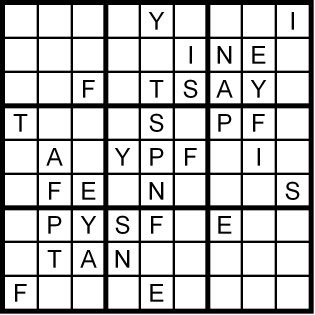 Yesterday's Classic 9x9 Word Sudoku puzzle was based on the word(s?) WHITECAPS. 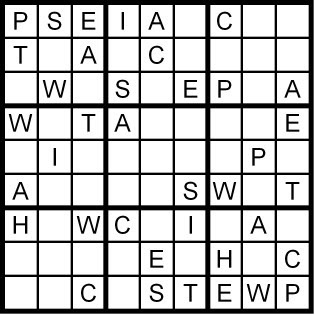 Today's Classic 9x9 Word Sudoku puzzle is based on the word WHITECAPS (or is that two words?). 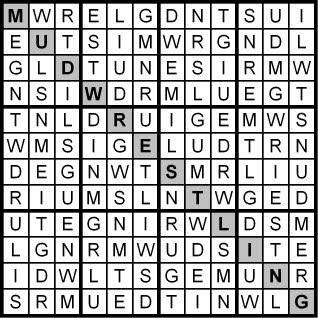 Yesterday's Word Sudoku puzzle was based on the word UNIVERSAL. 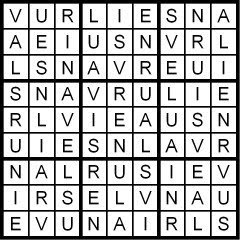 Today's Classic 9x9 Word Sudoku puzzle is based on the word UNIVERSAL. 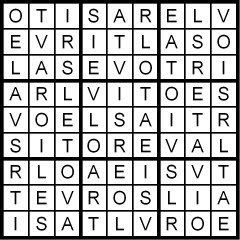 Yesterday's Classic 9x9 Word Sudoku puzzle was based on the word VIOLATERS. 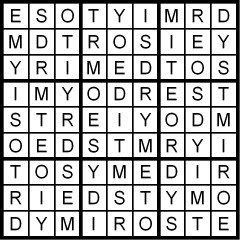 A new Word Sudoku puzzle in just a bit. 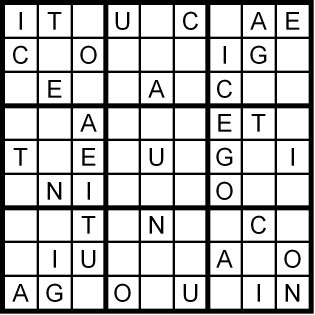 Yesterday's Classic 9x9 Word Sudoku puzzle was based on the word AUTOGENIC. 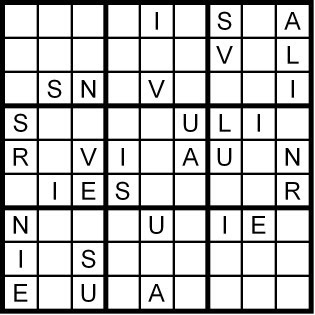 Today's Classic 9x9 Word Sudoku puzzle is based on the word AUTOGENIC. Yesterday's Classic 9x9 Word Sudoku puzzle was based on the word CAUTIONED. 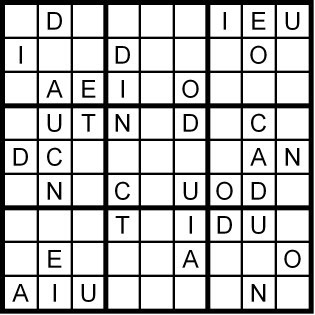 Today's Classic 9x9 Word Sudoku puzzle is based on the word CAUTIONED. 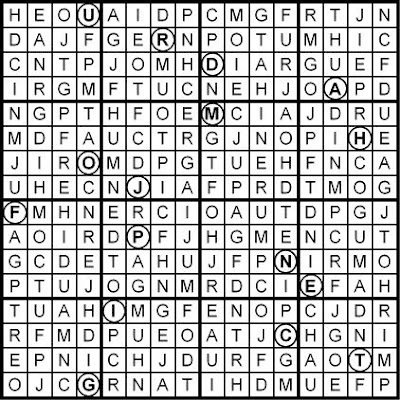 The Sunday Challenge 12x12 Hidden Word Sudoku puzzle was based on the letters in the anagram THE PLACING OF. 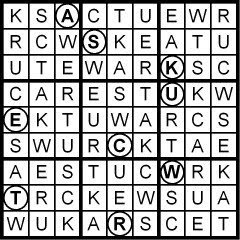 Today's Sunday Challenge is a 12x12 Hidden Word Sudoku puzzle based on the letters in the anagram THE PLACING OF. Yesterday's Word Sudoku puzzle was based on the word HEINOUSLY. 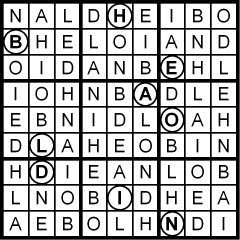 Today's Classic 9x9 Word Sudoku puzzle is based on the word HEINOUSLY. Yesterday's Word Sudoku puzzle was based on the words UNPAID FOR. 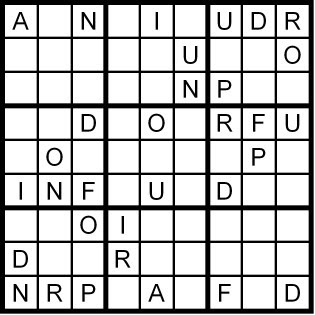 Today's Classic 9x9 Word Sudoku puzzle is based on the words UNPAID FOR. 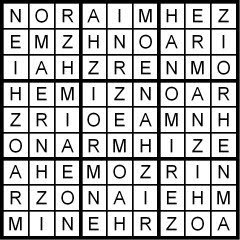 Yesterday's Word Sudoku puzzle was based on the word HARMONIZE. A new puzzle in a little bit. 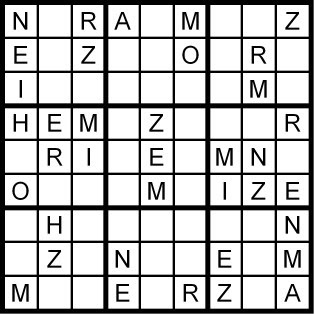 Today's Classic 9x9 Word Sudoku puzzle is based on the word HARMONIZE. 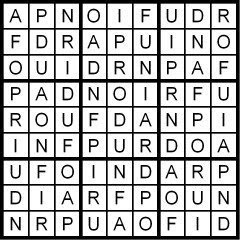 Yesterday's Classic 9x9 Word Sudoku puzzle was based on the words SAFETY PIN. A new puzzle in a while! 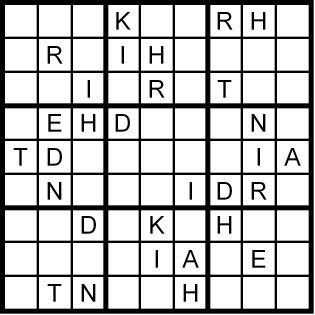 Yesterday's Classic 9x9 Word Sudoku puzzle was based on the words KIND HEART. A new puzzle in a little while. 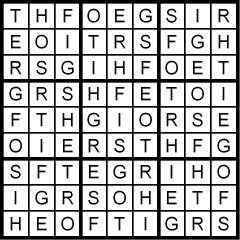 Yesterday's Classic 9x9 Word Sudoku puzzle was based on the words GIFT HORSE. A new Word Sudoku puzzle for you shortly. Today we're finally back to normal! 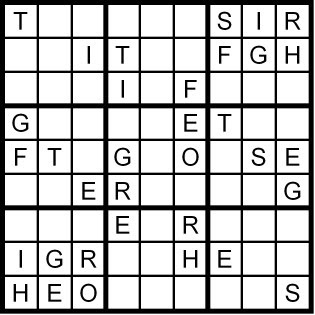 Here's a Classic 9x9 Word Sudoku puzzle for you, based on the words GIFT HORSE. 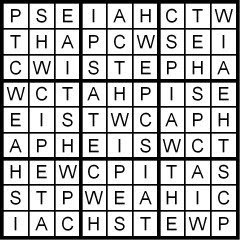 Yesterday's 12x12 Hidden Word Sudoku puzzle was based on the letters in the anagram SLING WET DRUM. 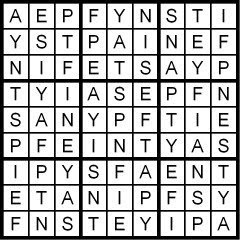 A new Word Sudoku puzzle for you in just a bit. 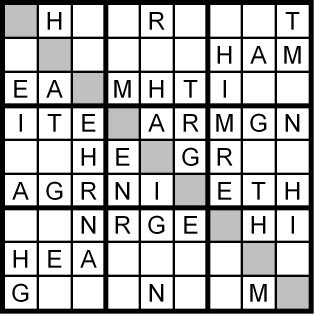 Today's Sunday Challenge, a 12x12 Hidden Word Sudoku puzzle, is based on the letters in the anagram SLING WET DRUM. Yesterday's Word Sudoku puzzle was based on the word BUDGETARY. 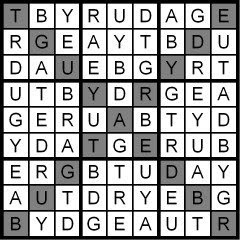 The Sunday Challenge, a 12x12 Hidden Word Sudoku puzzle, comes up in just a bit. 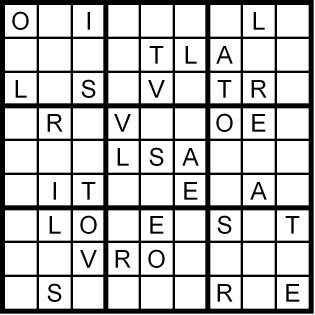 We're back to normal, after our 10-day diversion into "Qudoku" puzzles...so this will probably seem very simple! Good! After those 16x16 grid Qudoku puzzles, you need a break! 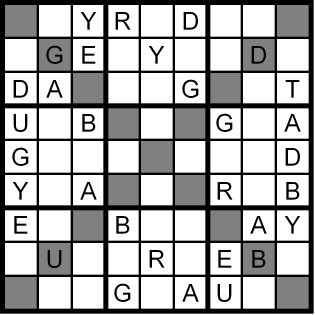 Today's 9x9 Diagonal Word Sudoku puzzle is based on the word BUDGETARY. Solution first thing in the morning, followed shortly thereafter by the usual 12x12 Hidden Word Sudoku Sunday Challenge. 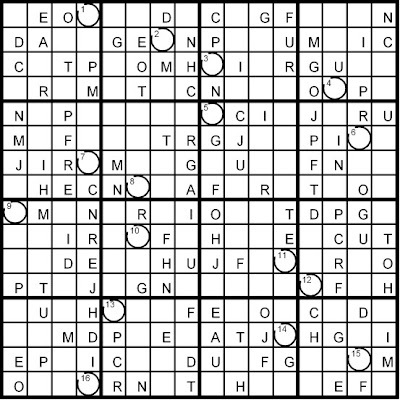 Yesterday concluded our 10-day discussion of Word Sudoku puzzles mixed with discoverable quotes (what I call "Qudoku") with some large and very tough puzzle grids--16x16. I also presented a variation of such a large grid meant to make the puzzles simpler (and therefore more fun, at least to me!). I split the one large grid into two smaller grids. 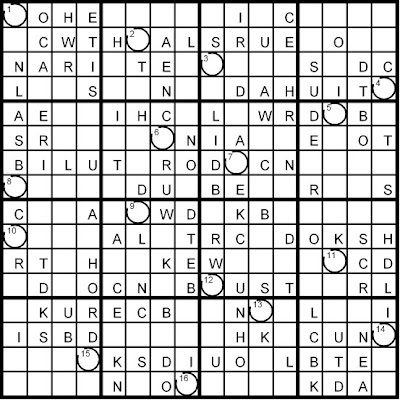 Here's the first Qudoku puzzle set again, with two 9x9 Word Sudoku puzzles supplying the letters to the quote grid. 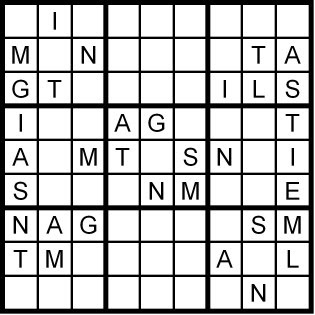 In a little while, I'll return to the puzzle display format I've used since I began this blog--since it's Saturday, I'll present you normal-grid-size (9x9) Diagonal Word Sudoku puzzle. 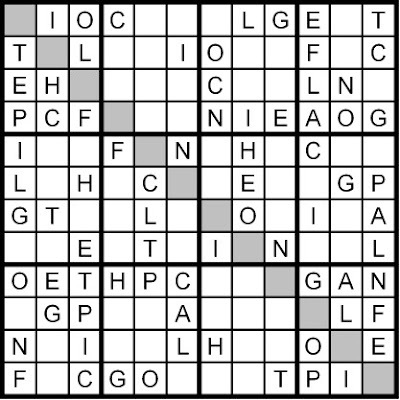 Today we’ll finish our tour of oxymoronic Qudoku puzzles using 16x16 grid-size Word Sudoku puzzles to supply the letters for the oxymoron. I find the large size unfinishable, if that’s a word. So I often break up what would normally be a 16x16 Qudoku into a “Two Qudoku” puzzle set with two 9x9 Sudoku puzzles supplying the letters. But let’s begin with the large size. If 16x16 grids are too hard, what’s the fun of attempting longer quotes that use many letters? Well, sometimes, with some ingenuity, you can break the large number of letters into two sets, and form regular-sized 9x9 Word Sudoku puzzles out of each set, so that each puzzle is quite solvable in a reasonable amount of time (thus fun!) and the combined set of letters generates what you need to fill in the quote. But if the puzzle only needs 16 letters, where do we get the 18 letters needed for two 9x9 puzzles? EASY! 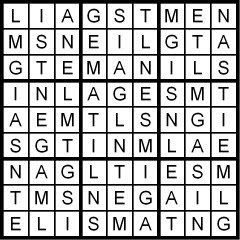 Repeated letters in the different puzzles, or extra letters that are there for ease of finding an anagram! Solutions first thing in the morning. 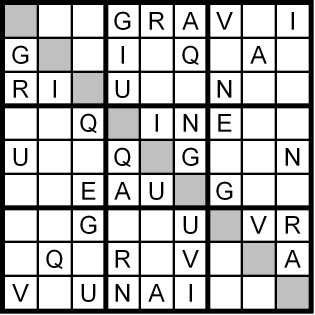 I’ll return to my normal daily Classic 9x9 Word Sudoku pattern tomorrow--just in time for the weekend. 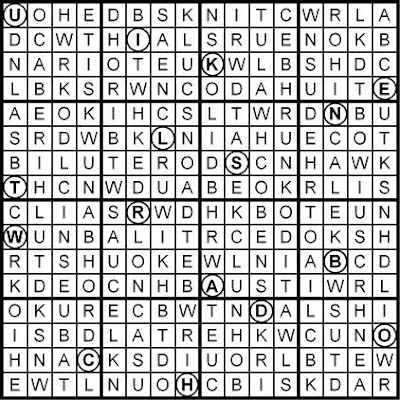 I hope you enjoyed this 10-day interlude to explore a different kind of Word Sudoku puzzle, combining Sudoku with quips, quotes and even oxymorons in something I call “Qudoku.” Please let me know what you thought. Interesting? Stupid and boring? Way over the top? Or would you like more of these? I have created two books of these Qudoku puzzles, of all sizes, just like what we did the past ten days. But those pesky publishers aren’t convinced yet that there’s still a market for new Sudoku books, especially puzzle variants such as Word Sudoku. Your posts here could possibly help change their minds!